I am looking for a specific example of a battering ram used to breach the gate of a castle or fortification in Europe. I can find lots of indirect references to the use of battering rams on gates (Valturio's De re militari, Vegetius' Epitoma) but no actual examples. Likewise, I can find examples of their use to breach walls but not gates (siege of Paris, Masada, Josephus The Jewish War 3.7.19, siege of Hurara, Battle for Jerusalem in 70 AD). I have not been able to find an example of one being used on gates. I admit I am used to dealing with history on a geologic scale so I have had a lot of difficulty researching primary historical sources. 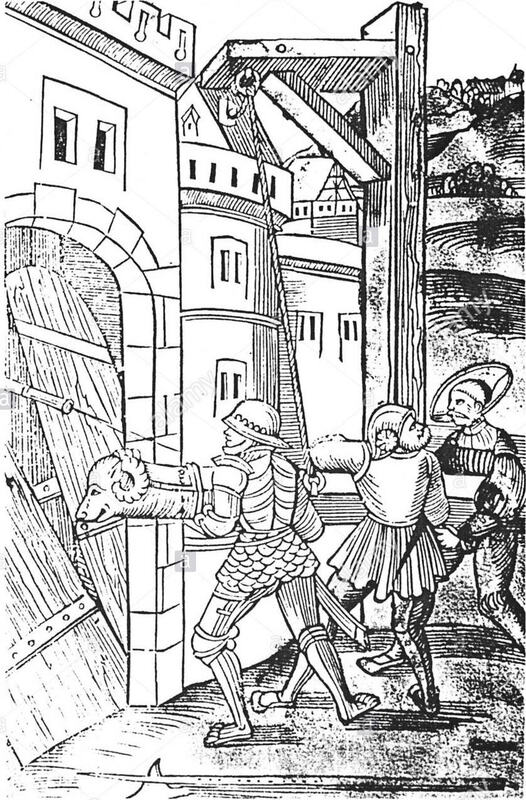 There appear to be very few recorded, specific examples of the successful use of battering rams on gates in either ancient or medieval times, at least compared to successful assaults on walls. Contemporary sources are often either unclear about how gates were assaulted, or don't say whether entry was gained through the walls or through a gate. The clearest example is Richard I's assault on Messina. In the Chronicon de rebus gestis Ricardi Primi, the chronicler Richard of Devizes relates how Richard I of England, during the Third Crusade, captured Messina in Sicily on October 4th, 1190 by breaking down the gates with a battering ram. The king, acquainted with nothing better than to take cities by storm and batter forts, let their quivers be emptied first, and then at length made his first assault by his archers who preceded the army. The sky is hidden by the shower of arrows, a thousand darts pierce through the shields spread abroad on the ramparts, nothing could save the rebels against the force of the darts. The walls are left without guard, because no one could look out of doors, but he would have an arrow in his eye before he could shut it. The King of Sicily, Tancred, was forced to sign a treaty, one of the terms of which was compensation for Richard's sister Joan's lost inheritance (Tancred had imprisoned her and taken her dowry and dower). This appears to have been very improvised and perhaps not a proper battering ram but seems worth mentioning nonetheless. Arnulf was crowned Holy Roman Emperor for his efforts but Pope Formosus died the same year (somewhat bizarrely, his corpse was exhumed and put on trial in 897 and his papacy declared null - see Cadaver Synod). The Vikings attacked the strongly-sited city of Chartres in 857 or 858, having navigated the river Seine, and apparently broke in through the gates without difficulty, causing mayhem and massacre. A number of failed attempts on gates using battering rams are mentioned. Among these are Philip II of France's assault on Châteauroux in 1187, a Danish assault on Paris in 886 and an attempt by El Cid to batter down a gate in Valencia in 1094. These failures often involved the destruction of the battering ram by the defenders, or defenders disrupting the ram by using hooks or ropes to grab it, or by the attackers simply being overwhelmed by the missiles rained down on them. In theory...represented the weakest point in the defensive circuit, and might even be vulnerable to fire; but for that reason any right-minded defender concentrated his efforts there. Gate towers were one way of helping to protect the gate and even a simple ditch could be a major obstacle as it would have to be filled in first. In such cases, catapults (if available) were a much safer option, and attempts were also made to set gates on fire. Attackers would also on most occasions have been aware that, even if they broke down the gate, there were often formidable defences on the other side. Narrow passages leading from the gate entrance were kill zones, with slits in the walls for defenders to fire down on the attackers who would find it hard to strike back. Walls, although much thicker, were harder to defend for the simple reason that there was much more to defend. Also, ramming a wall did not necessarily mean having to bring it down; often, rams weakened walls enough so that they would crumble, especially if sappers were at work undermining the foundations. Although there are quite a number of examples of attackers with battering rams either succeeding or failing to breach walls, I have not turned up specific cases of assaults on gates (though there must have been). One problem is that sources simply mention 'Machines of War'. Campbell & Hook mention several examples of the Carthaginians using battering rams in Sicily, but always to 'shake the walls'. Rams do not appear to have been used much in ancient Greece, but the Spartans (according to Thucydides) did use one (unsuccessfully) against the walls of Plataea in 429 BC. The Romans used rams much more, along with other siege equipment, and Julius Caesar's forces successfully breached a gate during the war with Pompey but it's not clear whether rams were used. One of two depiction I've found of a battering ram being used against what appears to be a gate is the Assyrian King Shalmaneser III's assault on the Hattian city of Dabigu in the 2nd year of his reign (858 BC) (pdf) in central Anatolia (so marginally outside Europe). The other depiction falls outside the medieval period; it's a 1529 German woodcut. Unfortunately, the town being assaulted isn't mentioned. For the fire of vengeance, justly kindled by former crimes, spread from sea to sea, fed by the hands of our foes in the east, and did not cease, until, destroying the neighbouring towns and lands, it reached the other side of the island, and dipped its red and savage tongue in the western ocean. In these assaults, therefore, not unlike that of the Assyrian upon Judea, was fulfilled in our case what the prophet describes in words of lamentation; "They have burned with fire the sanctuary; they have polluted on earth the tabernacle of thy name." And again, "O God, the gentiles have come into thine inheritance; thy holy temple have they defiled," &c. So that all the columns were levelled with the ground by the frequent strokes of the battering-ram, all the husbandmen routed, together with their bishops, priests, and people, whilst the sword gleamed, and the flames crackled around them on every side. Lamentable to behold, in the midst of the streets lay the tops of lofty towers, tumbled to the ground, stones of high walls, holy altars, fragments of human bodies, covered with livid clots of coagulated blood, looking as if they had been squeezed together in a press;* and with no chance of being buried, save in the ruins of the houses, or in the ravening bellies of wild beasts and birds; with reverence be it spoken for their blessed souls, if, indeed, there were many found who were carried, at that time, into the high heaven by the holy angels. So entirely had the vintage, once so fine, degenerated and become bitter, that, in the words of the prophet, there was hardly a grape or ear of corn to be seen where the husbandman had turned his back. I put the reference to battering-rams in boldface. I always assumed from this quote that Gildas was referring to the use of battering rams to break down city gates and enter the cities. But this discussion shows that the battering rams could have been used to make breaches in city walls. And in fact this quote seems to refer to columns being toppled by battering-rams. The use of elephants to break down wooden gates in India was apparently feared enough for some gates to be equipped with anti elephant spikes to keep the elephants away. And it is said that one gate in India had a short length of wall built a short distance ahead of it, so that elephants or men with battering rams could not build up speed in a long straight run at the gate. Not the answer you're looking for? Browse other questions tagged military middle-ages ancient-history weapons or ask your own question. When the term “president” was used the first time? How were fortification doors protected against fire? What was the first example of a foreign mercenary unit?